the monsoon is late by a little more than a fortnight. And the alarm bells are already ringing furiously across the country. State governments, lulled into a false sense of security by the meteorological department's forecast of 'normal showers', have been caught off-guard. Though this is not an uncommon phenomenon in the country, yet this year the dry spell appears particularly menacing. The seriousness of the situation can be gauged from the recent statement of Union agriculture minister Ajit Singh that the country is on the verge of the most widespread drought in 12 years. This is because it has cast its shadow over states such as Haryana, Punjab, Himachal Pradesh, Kerala and parts of Bihar, that were not considered to be susceptible to drought. A glaring example is Uttar Pradesh (up). The up government has declared several of its districts drought affected, Bundelkhand and the western parts of the state being the worst hit (see map: Left high and dry ). Pawan Dubey, of Etah-based social organisation Nehru Yuva Kendra Sangathan is apprehensive: "It is an appalling situation. The region has been under a dry spell for more than a month now." The administration in a state that has received normal rainfall for the past 11 years is in complete disarray today. Is this lack of preparedness justified? No, say experts. "Governance in up is poor," laments N C Saxena, ex-member secretary of the Planning Commission, and adds: "Though up has watershed and various other water conservation programmes, nothing significant has been achieved." The onus lies primarily with the administration because the state's centralised irrigation system is under the control of the government. Consequently, groundwater is extracted incessantly with the myopic authorities failing to put in place any scheme to replenish it. The result: an infrastructure collapse during a crisis. While more than half of the tubewells in the state are now reported to be dry, the canals are faring only slightly better. The Central Ground Water Board survey for 2002 reveals that there is a decrease in groundwater level in 75 blocks of 29 districts in up. "In 1980, tubewells were dug 120 feet deep but by 1990 they were 140-160 feet deep. In 2002, the situation has worsened as the wells are 350-370 feet deep," says Satya Prakash Kureel, engineer, up Jal Nigam. The situation is indeed serious. Ironically, things would never have come to such a pass if the state government had the foresight to take precautionary measures during the past decade when it had literally poured in up. Even, western up received 69 millimetres rainfall, in June, 2002, which is below normal. If only 50 per cent of this was harvested, 3.5 lakh litres of water per hectare would have been available to the state today. Despite organising a seminar on rainwater harvesting in April this year, the up government has failed to explore this traditional time-tested technique. Policymakers are awakening to the gravity of the situation only now. Ajit Seth, resident commissioner and former principal secretary, rural development, up, says: "With the delay in monsoon, the concept of rainwater harvesting attains special significance." This is not the first time that the state machinery has failed to deliver. 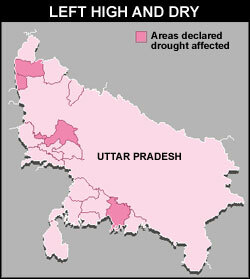 up was struck by a drought in 1987, too, when rainfall was 35 per cent below normal. But the authorities do not seem to have learnt a lesson. Admits Seth, "No long-term drought-proofing measures have been explored yet." The crisis is far more intense this year as rainfall is reported to be 52 per cent below normal. Is there any visible change in the attitude of the policymakers? Not really. The state commissioner for rural development, B P Nilratna, says "Now that the districts have been identified as drought-affected, we will formulate the required measures." Sadly, this 'awakening' may have come too late for the desperate farmers of up. Meanwhile, at an agriculture and relief ministers meeting, Ajit Singh announced a relief package including crop insurance and subsidised seed supply. But he said its effectiveness would hinge on how far the states can get into the act of declaring their districts drought-hit.